Last week, I was looking at some pieces of corduroy in my stash and realized one, a very dark brown fine-wale version, had stretch. Immediately, I thought it could become one thing only: 1970’s style flared trousers. So, I made the trousers. I used a pattern I had drafted last year for a pair of jeans and just added a lot more flare to the the lower legs. Although I hardly ever try for a 1970’s look, I know it is one that suits me. I also seem to have a lot of things in my wardrobe which lend themselves to the look. The tweed jacket, for example, is one I made years ago (as in: pre-blog…) with the intention of making it look 1950’s (which it does, when worn with a skirt). As usual, more about these trousers and more pictures on my blog! Yet another 60s style jumpsuit! I made this little baby earlier this year, using some dark green wool crepe. I had made the true-to-the-pattern version for summer, (Vogue 6435) and enjoyed styling it 1920s for a Speakeasy party. I loved how versatile it was, how comfy, and stylish. And, while I can still reach around to unzip it, how these jumpsuits have become fun, unique everyday wear! The first version used straps, and I wanted something that I could wear across the seasons, so I used a kimono bodice pattern I adapted from a 50s dress and the wonderful wide leg pants. Voila! Happiness. The same week I finished the green wool crepe jumpsuit, I cut out another one, using some woven acrylic deep/navy blue I had in my stash… Kind of awful fabric, but in the real world with kids and grime, and once a fortnight laundromat missions, it’s amazing, foody finger smears just wipe right off, if they even stick! The fabric is not so scratchy, I lined the bodice, but not the pants, the fabric has a great drape and is not too hot. It is nice with a brooch, a necklace. I love the 1920s, and this is great for the easy wear, beach pajama look (I need to find a halter top for another one..). I also love the 60s with the sci-fi futuristic Spacewear, and like to imagine the people of the world living in harmony and stylish jumpsuits….but that’s another story! I love how changing the accessories makes this little jumpsuit work with many stylish decades. Eep, can’t wait to make another one…. More over on my blog, of course, Vogue 6435. 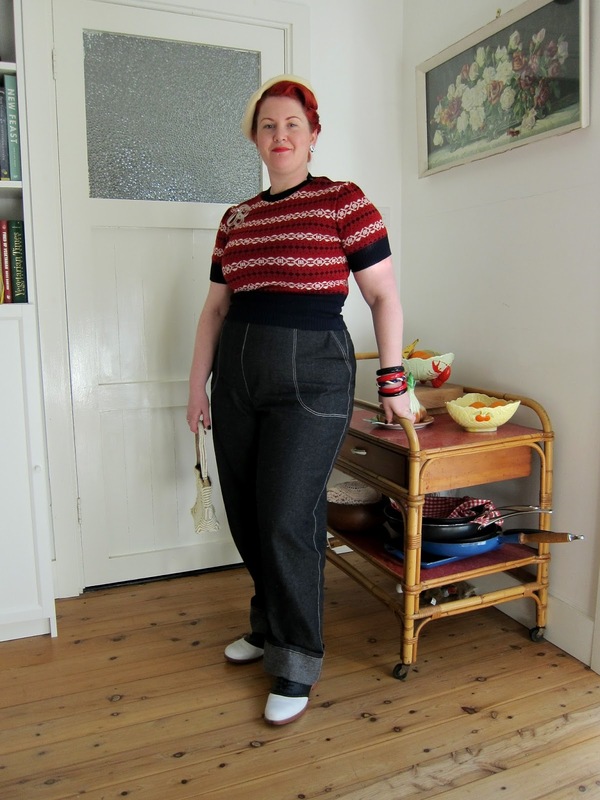 It might be hard to believe, but these jeans started life as very wide legged swing trousers, from EvaDress 3322. The fabric was a medium weight denim (not as heavy as rigid denim), and I used a beige top-stitch thread instead of golden-yellow. Result = Freddies of Pinewood eat your heart out! Super comfy and I need more pairs of these in my life right now! 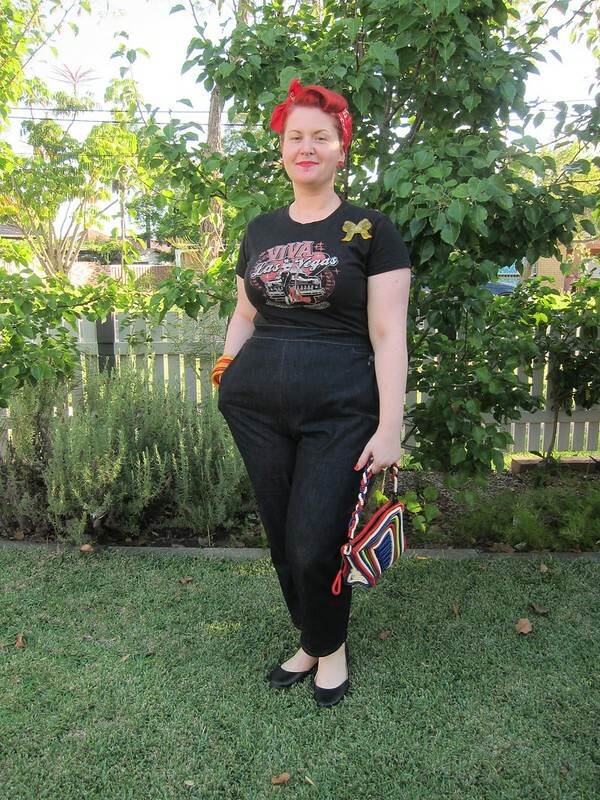 Smooth Sailing Trousers – My First Pair of Pants! After going through a phase of sewing nothing but knit dresses and T-shirts, I’m back with a very vintage-style garment! This is my first pair of pants, made from the Smooth Sailing Trousers pattern from Wearing History. 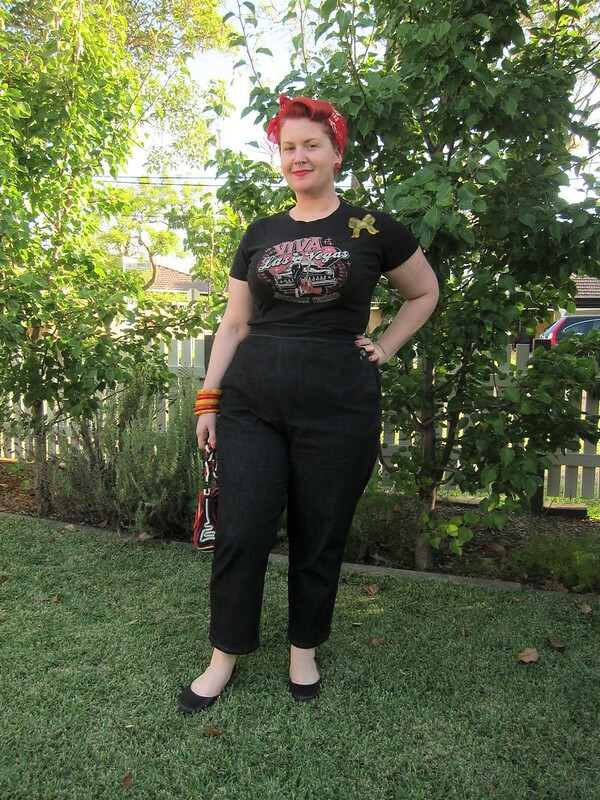 Since I became interested in vintage styles, I’ve always loved 30’s/40’s style wide-leg trousers, and this pattern was exactly what I was looking for! It’s hard to see because the fabric is black, but there are pleats at the front, darts at the back, a side zipper, and optional cuffs, belt loop and belt. I made the version without cuffs, but with the belt loops. I skipped the belt, though, because I have a couple black belts already! I cut a size 12 for the muslin and graded to a 14 at the hips, but ended up sizing up for a little more ease at the waist. I tweaked the fit a little though by keeping the darts, pleats and crotch curve from the size 12. I also shortened the pieces by 2″. I used a bamboo rayon (not sure what to call it exactly) with nice drape, but it ended up being really shifty and stretchy on the bias after I washed it – it was originally very crisp and linen-like. It probably wasn’t ideal for these pants, because they’ve really stretched out and need re-hemming (possibly some other alterations too…). 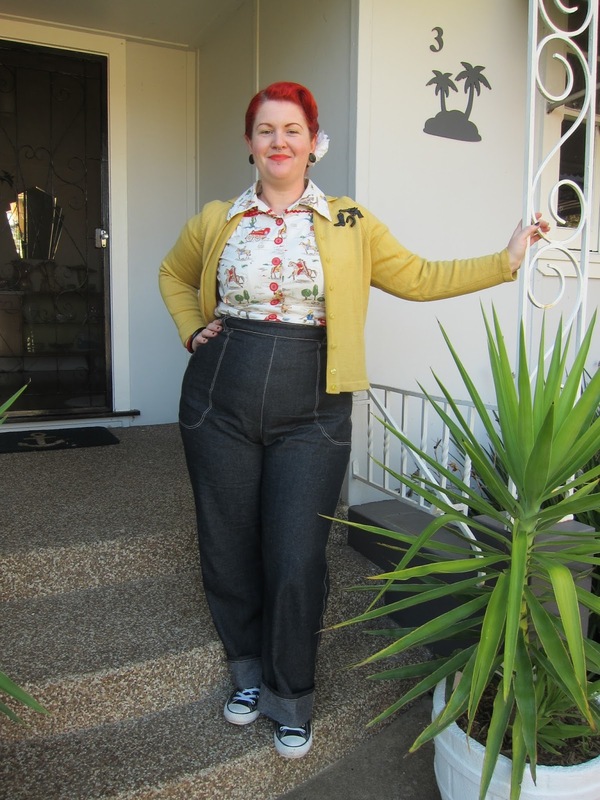 The pattern is very simple to construct, perfect for someone new to making pants. The hardest part was working with the fabric! If they hadn’t stretched out so much, I would have been very happy with how they turned out. Right now, I have a bit of a love-hate relationship with them, but I’ve made anther pair and I can definitely say that I love the pattern and the style! For more photos and construction details, check out my blog! I also wrote a detailed review of the pattern as a guest post on Sew Sweetness, if you want to know more about the pattern itself! Oh, and I also made the blouse I’m wearing in these photos. It’s the Sewaholic Pendrell, made from a muumuu that I bought at a thrift store! Thanks for reading! 2015 seems to be the the Year of the Pants for me – no more procastinating. 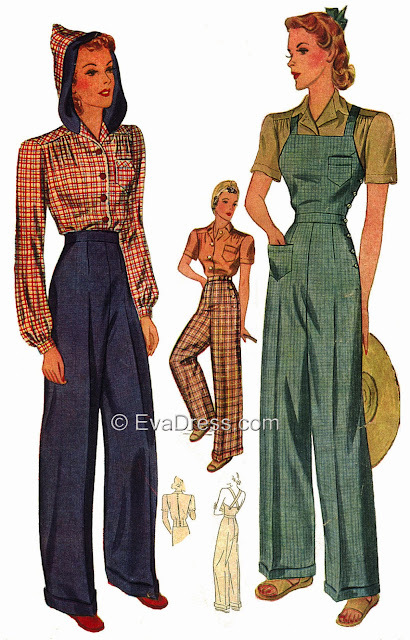 On the way to sewing my dream project – perfect vintage jeans – I finally made the EvaDress Wide Leg Trousers (3322), a repro of Simplicity 3322 c.1940. The fabric is navy gaberdine. I haven’t made an EvaDress pattern before, so I wasn’t sure what to expect with fit etc. I did have to make four muslins to get the fit right though – it may have been due to the pattern grading to a large size (I made size 40). Thankfully pants are normally pretty quick to sew up. The main changes I made were to use a back zipper instead of side buttons, and to lengthen the crotch depth by about 3/4 inch. I’ve already made another pair up in cranberry gaberdine, and have a chocolate pair waiting in the wings too. Even better, they go perfectly with a Smooth Sailing Blouse that I made a while back (isn’t orange and navy a great combination?). I think this may be the 15th time I’ve made this pattern up, it’s such a great staple. As always, there’s more on my blog! I’m a little bit obsessed with Butterick 5895 (Gertie’s pants) now that I’ve gotten the fit perfected – so I thought I’d try making a pair of western jeans (ranch pants) from the same pattern. The inspiration was this pattern – Advance 8341, View 1 – Frontier Pants. 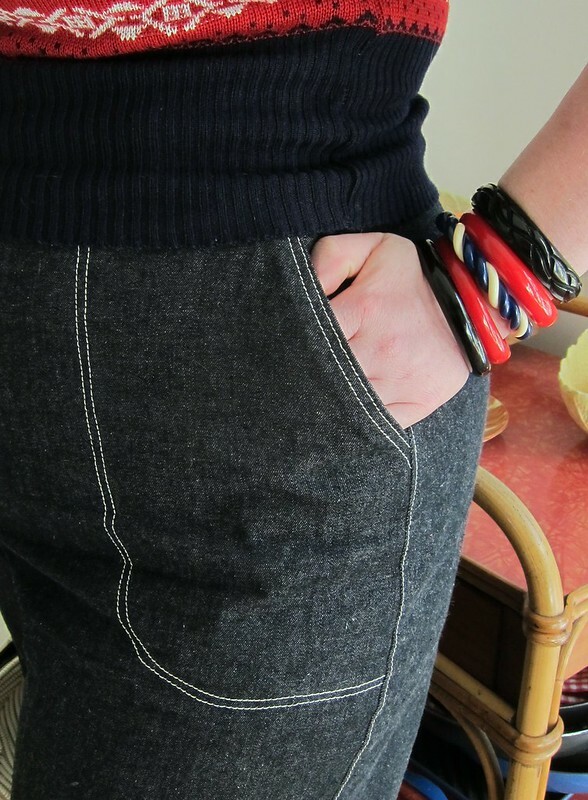 I guessed what the pockets should look like from a pair of Freddies Jeans, and added them to the Butterick version (and lengthened the legs). The pockets turned out better than I hoped for! I’m specially proud of the button holes – my machine is 1950’s and it’s pretty hard to do a nice button hole. The fabric is stretch denim, but it’s not super stretchy as it holds it’s shape really well. 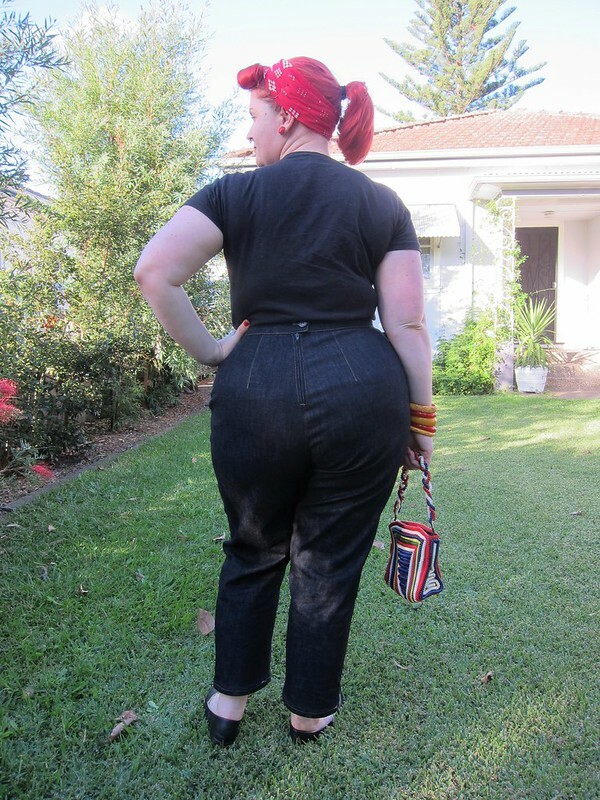 There’s nothing I would change about these jeans – not one thing! 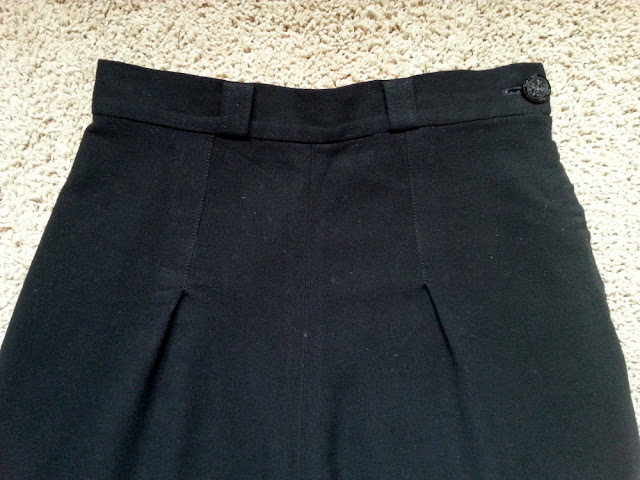 If you’re interested, I did a quick tutorial on my blog showing how to adjust your pants pattern to allow for a bigger booty or belly (and what the Butterick pattern looks like unmodified for curves).